After yesterday's furious rebound in the S&P, which almost appeared staged to confirm the Fed hasn't lost control after its shocking doubling down on dovishness which resulted in a bizarre drop in stocks in the last 30 minutes of trading on Wednesday, the rally once again fizzled overnight, dragged lower by European stocks with U.S. equity futures following, while the euro tumbled and 10-year German bunds slumped into negative for the first time since 2016 after miserable data from the German manufacturing sector renewed worries about global growth on Friday. The Stoxx Europe 600 reversed earlier gains, with German shares tumbling 0.6% to hit their lowest in two weeks as markets in Paris and London FTSE tumbled 0.8% after Markit reported that sentiment in Germany's manufacturing sector cratered, plunging to 44.7, the lowest since 2012. Europe’s auto sector led the fall, dropping one percent, while industrial goods and banks dropped sharply as well. Notable movers this morning included Aggreko (+3.8%) at the top of the Stoxx 600 after being upgraded to buy at Stifel Nicolaus. Smith’s Group (+1.1%) are in the green following the company stating they plan to separate their medical business and thereafter separately list it in the UK. The MSCI World index slipped 0.2%, pulling away from the 5-1/2 months high hit earlier in the week. U.S. stock futures indicated the souring mood would spill over to Wall Street, with e-mini futures for the Down Jones, S&P and Nasdaq all down 0.5%. Meanwhile, on Friday Bloomberg reported that U.S. officials downplayed the prospect of an imminent trade deal with Beijing, just as a U.S. trade delegation headed by Trade Representative Robert Lighthizer and Treasury Secretary Steven Mnuchin is set to visit China on March 28-29. ... as and sovereign bonds reversed earlier losses and the 10Y Bund drifted briefly back under 0.00% for the first time since 2016. 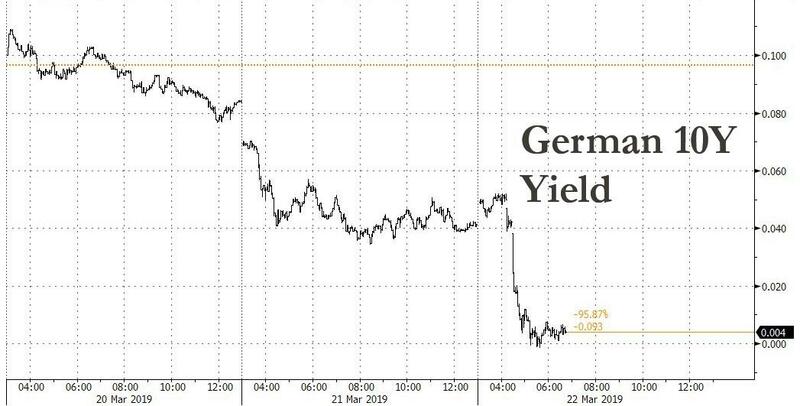 The decline in German bund yields comes after the U.S. yield curve flattened further overnight, indicating increased market expectations of a recession. 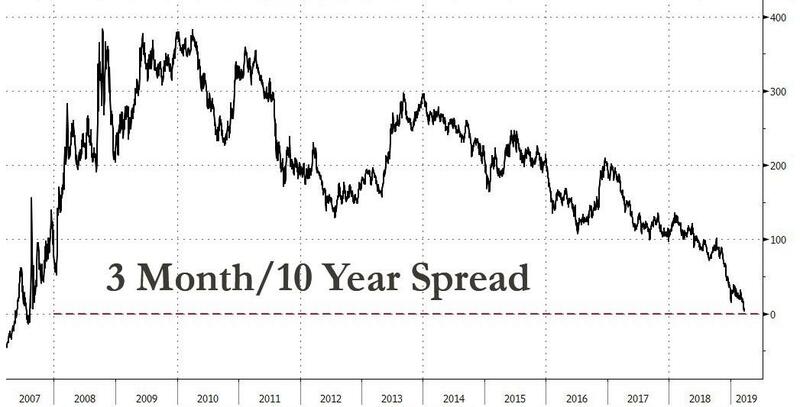 The spread between the three-month Treasury bill yield and the 10-year note yield shrank to its narrowest level since August 2007, collapsing to just 2 basis points. “The main market reaction to the Fed’s announcement was that it has become a consensus that the Fed’s next move is a rate cut,” said Naoya Oshikubo, senior manager at Sumitomo Mitsui Trust Asset. “As economic data from China and elsewhere has not bottomed out yet, investors will be looking at economic fundamentals for now. If there are improvements, then markets could roll back expectations of a Fed rate cut." The plunge in the euro helped push the dollar up 0.3 percent against a basket of six rival currencies in a second straight day of gains. One day after the EU granted Theresa May an unconditional 2 week Brexit delay until April 12, the algos were in charge of setting the price, with the British pound swinging wildly without news, and after sliding sharply from 1.3160 to 1.3082 before squeezing the new weak hand shorts sharply higher. On Thursday, sterling plunged towards $1.30 on Thursday in its biggest one-day fall of 2019 as fears mounted that Britain would crash out of the EU on March 29. The EU has said Britain can have a short delay to Brexit, as requested by May, but she must first win parliamentary approval for her withdrawal deal that sets out the future relationship between London and its biggest trading partner. Elsewhere, in commodity markets, oil prices pulled away from 2019 peaks as economic growth concerns hurt sentiment, pausing a three-month rally that was driven by OPEC-led supply cuts and U.S. sanctions against Iran and Venezuela. Brent crude oil futures and U.S. crude futures slipped both around 0.7 percent to $67.36 and $59.56 per barrel respectively. Gold headed for its best week since early February. Earlier in Asia, a late-day turnaround put benchmark stock indexes in Japan, Korea and Australia back into the green. Italy’s populist government is struggling to reach agreement on a tax-reduction plan that could extend the country’s indebtedness and lead to another clash with the European Union. Bond yields around the world are tumbling to multi-year lows as the global shift by central banks to a more accommodative stance has put the kibosh on the oft-predicted but still-unrealized end of the long bull run in government debt. European Union leaders staved off the threat of the U.K. crashing out of the bloc without a deal next Friday by giving Theresa May an extra two weeks to work out what to do. But in private, EU leaders weren’t so optimistic that May will be able to pull it off next week. U.S. officials are downplaying the prospect of an imminent trade deal with China as President Donald Trump’s top negotiators prepare to head to Beijing for a fresh round of talks next week, according to people familiar with the matter. Turkey’s lira tumbled along with bonds and stocks amid mounting signs local investors are losing faith in the currency ahead of elections later this month. The lira weakened more than 2 percent to 5.5791 per dollar, breaking out of a tight range that’s held since November. Asian equity markets traded mixed as the region failed to sustain the momentum from the tech-led advances on Wall St, where the sector rose by nearly 2.5% in the S&P 500 with Micron shares up over 9% post-earnings and with Apple the best performer in the DJIA on bullish broker calls. As such, ASX 200 (+0.5%) was positive as tech names tracked the upside of their US counterparts and with broad strength seen across sectors aside from the mining names amid a subdued metals complex, while attempts by the Nikkei 225 (U/C) to play catch up to the prior day’s Fed-inspired performance was cut short by recent JPY strength. Elsewhere, Hang Seng (+0.1%) and Shanghai Comp. (U/C) were negative with focus in China centred on earnings releases including Tencent and PetroChina which both fell short of net profit estimates and resulted in the latter leading the declines in Hong Kong. Finally, 10yr JGBs were higher with prices boosted in the wake of the dovish Fed and as longer-term yields dropped to multi-year lows last seen in late 2016. In spite of a relatively upbeat open, major European indices are firmly in the red [Euro Stoxx 50 -0.7%], following disappointing European PMI data; with many of the indicators unexpectedly falling into contractionary territory including French, EZ & German Manufacturing PMIs, the latter dropping to a 72-month low of 44.7. The strong downside seen in European stocks, and more broadly in the EUR and 10yr Bunds – where the yield fell below 0% for the first time since October 2016, can be attributed to increased concerns surrounding EZ growth. Unsurprisingly, given the data induced downturn sectors are firmly in the red with some underperformance seen in industrial names following the dismal Manufacturing PMI from Germany; with the likes of Siemens (-1.9%) and Airbus (-1.3%) weighed on by the data, for reference the two Co’s have a joint weighting of around 16% in the Stoxx 600 industrial sector. Notable movers this morning include, Aggreko (+3.8%) are at the top of the Stoxx 600 after being upgraded to buy at Stifel Nicolaus. Smith’s Group (+1.1%) are in the green following the Co. stating they plan to separate their medical business and thereafter separately list it in the UK. While, Deutsche Bank (U/C) did initially trade with gains of around 1% after the Co. stated they expect 2019 revenue to be slightly higher than the 2018 figure. In FX, the euro currency has slumped vs the Dollar, and right across the board in wake of the preliminary March PMIs that defied expectations for some form of recovery or at least stability, as Germany’s manufacturing sector plunged deeper into recessionary territory and France entered contraction to pull the pan-Eurozone measure further below 50. Eur/Usd was already on the retreat from near 1.1400 highs, but then lost the 1.1300 handle before finding some support and underlying bids, while Eur/Gbp reversed course from 0.8680+ towards 0.8600 even though the Pound also weakened in sympathy, not to mention ongoing/heightened Brexit uncertainty. CHF - The Franc has benefited from the Euro’s demise with the cross down near the middle of a 1.1300-1.1230 range, but is losing out vs the Greenback as Usd/Chf bounces from 0.9915 lows to 0.9970 and the DXY hits new post-Fed recovery peaks just over 96.800 given the Eur’s heavy weighting in the basket. AUD/CAD/NZD - All losing out to their US peer as the overall risk tone sours on the back of the aforementioned bleak EZ surveys, with Aud/Usd back under 0.7100, Usd/Cad close to the top of a 1.3385-50 band and Nzd/Usd also relinquishing its big figure+ status (0.6900) forged after solid NZ Q4 q/q GDP earlier this week. GBP - As noted above, Sterling has suffered a bout of Euro contagion with Cable slipping from 1.3150+ to sub-1.3100 at one stage having derived a degree of comfort from breathing space afforded by the EU on Article 50, albeit still aware that this could just be a stay of Brexicution if UK PM May fails to convince a majority in Parliament to back the WA again. NOK/SEK - Also victims of the current bout of broad risk aversion, and unwinding recent outperformance even against the Eur. In fact, Eur/Nok has bounced relatively firmly from Thursday’s near 9.5900 lows irrespective of Norges Bank rhetoric reinforcing the hawkish hike, while Eur/Sek is currently hovering around 10.4700 within 10.4960-4250 parameters. Note, however, Eur/Nok should be capped ahead of 9.7000 given a hefty 1.4 bn option expiry, while similar size resides down at 9.5000. JPY - Bucking the general trend and gaining some ground vs the Usd due to the Yen’s greater safe-haven allure, as the headline pair pulls back from circa 110.90 to around 110.45 and into very large option expiry terrain between 110.40-65 (3 bn). In commodities, Brent and WTI are firmly in the red, impacted by the change in market sentiment following poor PMI data; diverting from the relatively directionless trade seen overnight with both Brent and WTI now at the bottom of what is still a relatively narrow range, currently trading around USD 67.40/bbl and USD 59.50/bbl respectively. Elsewhere, PVM note that the USD 70/bbl threshold remains elusive for Brent, which notched a 2019 high of USD 68.69/bbl recently; PVM highlight that the complex is generally stagnant awaiting a strong catalyst, likely in the form of a US-China trade agreement. Gold (+0.3%) benefitted from the negative diversion in market sentiment, with the yellow metal trading at the top of its USD 8/oz range at around USD 1313/oz. Separately, China’s Mofcom has announced it is to implement a temporary antidumping measure in stainless steel billets and hot-rolled steel plate imports from the EU, Japan, South Korea & Indonesia. Elsewhere, Glencore’s Australian McArthur zinc mine have suspended production ahead of an approaching cyclone. Turning to the day ahead, the European Council summit enters its second day. On the agenda for discussion include “strengthening the European economic base” and climate change, while leaders “will also review progress in tackling disinformation and the need to protect the democratic integrity of the European and national elections”. In terms of data, we already had the dismal flash PMIs for France, Germany, the Eurozone with the US following suit, including manufacturing, services and composite figures. In the US, we have wholesale inventories data for January and existing home sales data for February. In Canada, we’ll get February CPI data and January retail sales, while the Russian central bank will also be announcing its key rate. If you’ve met me over the last couple of weeks and I’ve smelt funny then apologies but my wife told me last night that she only just realised that she recently filled up our ecologically friendly reusable huge clothes washing bottle with washing up liquid rather than clothes washing liquid. I must admit that I passed the washing machine the other day and wondered why it looked so bubbly. I just assumed the bubbles were another side effect of the dovish Fed. At least the risk of the U.K. running out of washing up liquid and washing powder in just 7 days time has reduced now after the EU summit last night. Day 1 of the summit saw lots of speculation but in the end it seems the continent’s leaders tried not to escalate the Brexit tensions too much. They eventually offered an unconditional extension to Article 50 until April 12 which extends to May 22 if the deal is passed before hand. This will reduce the cliff edge risk for next week but assuming Parliament won’t support May’s deal, the UK will within three week face a choice between a long extension or a no-deal Brexit. The pound, which had traded as much as -1.47% weaker yesterday, rebounded a bit on the unconfirmed reports that we were heading towards a short reprieve to close down -0.69% at 1.3107 and is trading up (+0.18%) this morning. A respected journalist (Sky News Deputy political editor Beth Rigby) tweeted earlier in the day that in the event May faced a choice next week between either a no-deal Brexit or a long extension, then May would go for no deal. So still a very high degree of uncertainty as to what happens if MV3 gets defeated early next week assuming the government are allowed to bring it back. So in the near term all eyes on the DUP and hard line Tory MPs again. Outside of Brexit the main developments yesterday took place in European sovereign bond markets, with a major rally happening as investors reacted to the Federal Reserve’s dovish stance the previous day. German ten-year bund yields fell to 0.041%, their lowest level since October 2016, although above their session lows when they reached 0.0318%. For reference, the last time ten-year bund yields closed below zero was in October 2016, with yields having been negative for most of the period between June and October that year - the only time in history. Gilts also rallied yesterday, with ten-year yields falling -9.3bps to their lowest levels (1.064%) since September 2017, while French ten-year yields fell -5.6bps to their lowest (0.403%) since October 2016. The fall in yields meant that financials dragged on Euro equities, with the EURO STOXX Banks index down -1.69% yesterday. The fact that Treasuries climbed +1.1bps and up +3.9bps from the session lows suggests that Europe may get some yield relief at least at the open today. However much will depend on the latest flash PMIs which will dictate the tone in Europe. Consensus expectations are for a moderate stabilisation, headlined by the euro area’s aggregate manufacturing index, projected to rebound 0.2pts to a still-contractionary reading of 49.5. The services print is forecast for 52.7 and the composite at 52.0. 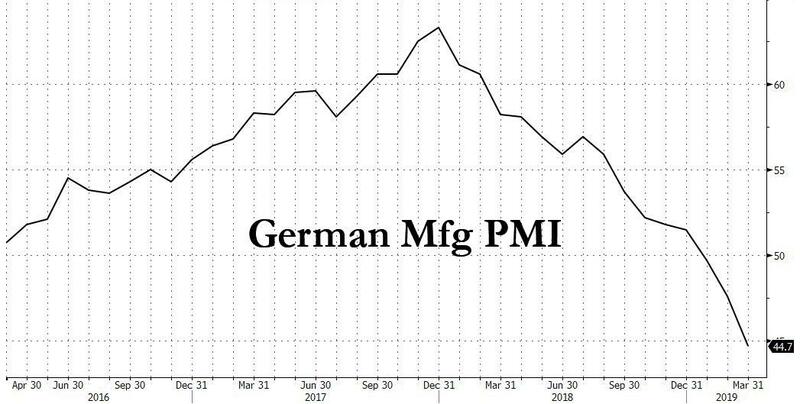 Those expectations mirror the country-level projections, with Germany’s manufacturing print expected at 48.0 from 47.6. France’s is forecast for 51.4 from 51.5. This morning Japan’s flash March manufacturing PMI came in at 48.9, the same as last month and marking the second month of contraction. 10yr JGBs are 3bps lower this morning at -0.07% - the lowest since late 2016. Back to yesterday. Yields troughed around lunchtime and then risk sentiment improved markedly throughout the US session. Initially, the S&P 500 had opened lower, as investors worried about the reasons for the dovish Fed; the theory being that a softer outlook is not as bullish as a hot-running economy. As our economists pointed out, a couple of the Fed preferred yield curve measures have continued to flatten. Indeed, the Fed’s preferred metric (3m treasury bill rate 18months forward versus the current 3m treasury bill) has inverted all the way to -13bps. However, sentiment flipped on the data and positive earnings news (see below), and by the end of the US session lower yields and a dovish Fed were seen as a good thing again. The S&P 500 rose +1.09% and back to five month highs. With the futures market pricing around 18bps of cuts over the next 12 months and the equity market just 3% away from its all-time high, it’s hard to believe both are compatible with each other medium-term but for now it’s Goldilocks. The US market rally was led by the tech sector, with the NASDAQ advancing 1.42% and the Philadelphia semiconductor index gaining +3.50%. That move was driven by positive earnings from Micron Technologies (+9.64%), a major US chipmaker. The company’s CEO said that, while there are “industry headwinds in the near term,” he nevertheless sees “demand growth strengthening in the second half of calendar 2019.” That helped ease recent concerns about the sector, with the Philly semiconductor index now up +34.83% from its December trough. Earlier in Europe, the STOXX 600 pared losses to close –0.04% after the aforementioned stronger than expected data release from the Philadelphia Fed, whose index of current manufacturing activity rose to 13.7 in March (vs 4.8 expected), bouncing back from last month’s -4.1 figure (which was the lowest in over two years). The rise was the biggest one-month move since 2010. The breakdown was less encouraging however, with the index for six-month forecasts dropping to its lowest since February 2016. Looking across countries, aside from the FTSE 100 outperformance (+0.88%) on a Brexit related weaker GBP story, the FTSE MIB also ended the day +0.20%, although both the CAC 40 (-0.07%) and the DAX (-0.46%) closed lower. 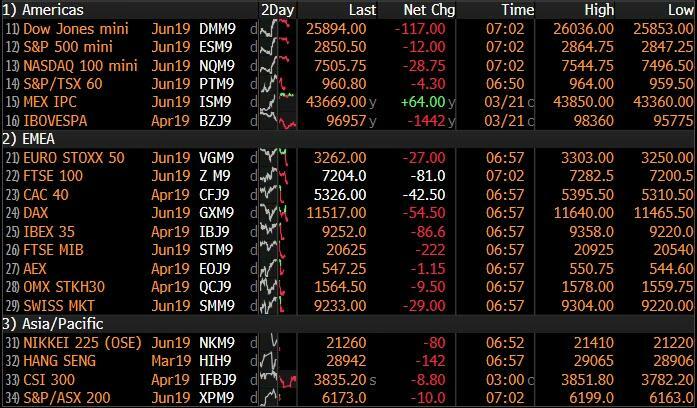 Overnight in Asia markets are largely heading lower and haven’t been swayed by the US turnaround with the Nikkei (-0.15%), Hang Seng (-0.32%), Shanghai Comp (-0.77%) and Kospi (-0.17%) all down. In other news, Tencent said yesterday that its net income fell 32% yoy in Q4, the largest drop in over a decade. The stock has declined by -3.19% over two days (-1.27% today). In terms of other overnight data releases, Japan’s February CPI came in at +0.2% yoy (vs. +0.3% yoy expected) while core CPI stood at +0.7% yoy (vs. +0.8% yoy expected) and core-core CPI came in line with consensus at +0.4% yoy. Moving on to trade, China’s Ministry of Commerce said in an overnight statement that the USTR Robert Lighthizer and Treasury Secretary Steven Mnuchin will be travelling to China for trade talks at the end of next week while China’s Vice Premier Liu He will then travel to the US in April to continue the trade talks. The Brexit-induced drama outweighed some positive economic data, with better than expected February retail sales data seeing a 0.4% mom increase (vs -0.4% expected). In addition, public sector net borrowing (excluding public sector banks) came in at £0.2bn in February (vs. 0.7bn in January), bringing YTD borrowing (April-Feb) to its lowest level for 17 years. 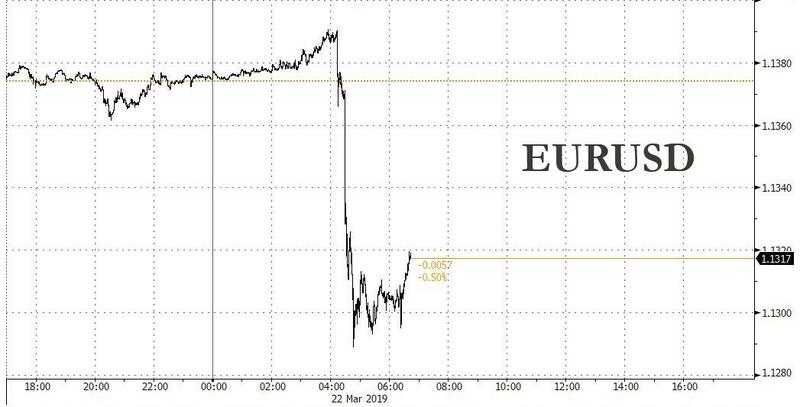 In other central bank news, the Norweigian Krone appreciated by +0.87% versus the euro yesterday as the central bank raised interest rates by 25bps to 1%. While the rate hike was expected, the interest rate forecast for 2019 was faster than the Norges Bank had indicated in December. Governor Olsen said that he saw a greater than 50% probability that there would be a rate hike in June. Elsewhere, the Swiss National Bank kept their main interest rate at -0.75%, in line with expectations. However, they revised down their inflation forecasts, seeing 2019 inflation at 0.3% (vs 0.5% in December) and 2020 inflation at 0.6% (vs 1.0%). In terms of other data releases yesterday, the advance Euro Area consumer confidence reading came in at -7.2 in March (vs 7.1 expected). Meanwhile, in the US initial jobless claims fell to a four-week low of 221k (vs 225k expected), and February’s leading index came in at 0.2% (vs 0.1% expected). Turning to the day ahead, the European Council summit enters its second day. On the agenda for discussion include “strengthening the European economic base” and climate change, while leaders “will also review progress in tackling disinformation and the need to protect the democratic integrity of the European and national elections”. In terms of data, we have the prelimary PMI releases for France, Germany, the Eurozone and the US, including manufacturing, services and composite figures. In the US, we have wholesale inventories data for January and existing home sales data for February. In Canada, we’ll get February CPI data and January retail sales, while the Russian central bank will also be announcing its key rate.